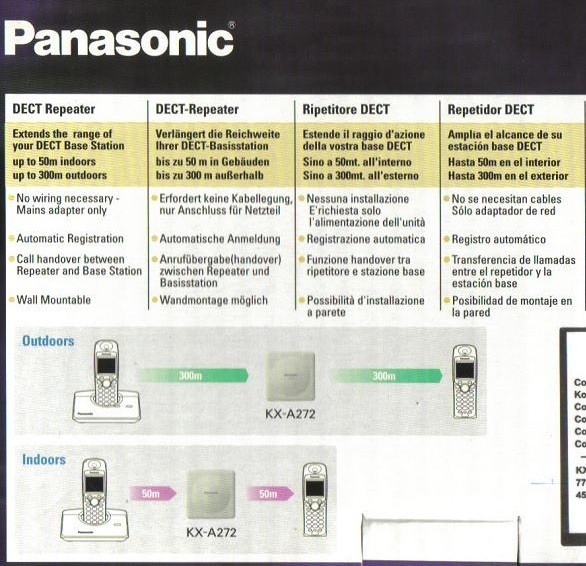 The Panasonic KX-A272 is a DECT repeater that is compatible to use for Panasonic KX-TDA100, KX-TDA200 & KX-TDA600 as well as the Panasonic KX-TDE100 & KX-TDE200 telephone systems. 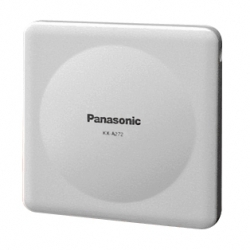 It extend the range of cordless DECT telephones and PBX cell stations. One unit extends range by up to 300m in all directions so multiple floors can be covered. A maximum of 6 repeaters can be used with a DECT base station while up to 18 repeaters can be registered with a PBX cell station - using Serial Repeater ID Programming. Repeaters can be configured in a star pattern to extend range in different directions, chained three levels to increase distance or a combination of both. Two handsets can be used concurrently within the repeater range. Full handover with TDA PBX products. Full handover TD1232/TD816 with TD7590 (a software upgrade may be necessary). Range extender (no handover) using TD7580. Range extender (no handover) using TD7590 (without the software upgrade).